Beginning in 1947 the Back Up Card first appears. They are made from thin cardboard which accounts for the lack of holding up to abuse. 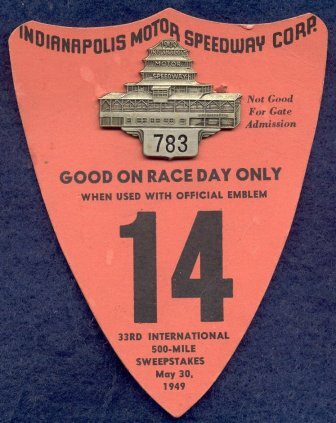 The back up card was used on Race Day and was not good for admission to the grounds. They were used in conjunction with either a bronze or silver badge for access to the garage area and pits. To see what a particular back up card looked like from a given year, please refer to the Pit Badge page for that year. The number on the back up card represented what type of access one had i.e. 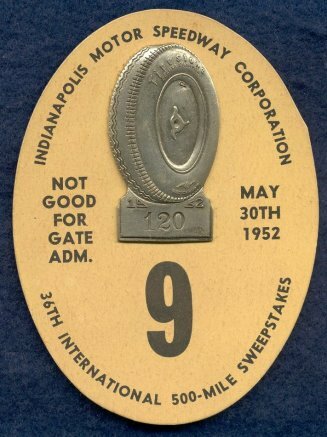 a "1" or "99" were usually those associated with a race team - drivers, owners crew, etc. and were THE back up card to have as it allowed access to the pits during the race - all other numbers had to leave the pit area at various times before the race. *The following #'s 1, 2, 3, 4, 5, 7, 8, 9, 10, 11, 12, 14, 15, 44, 51, 55, 77 and 99 have been accounted. There are probably other numbers so let us know. Note the differences between the regular 1971 and 1971 NATO back up cards. Only a hand full of NATO back up cards are known to exist making the 1971 NATO back up card the rarest and most valuable of all back up cards. One of the more unusual back up cards is the "Lap Prize Donor" from 1982. 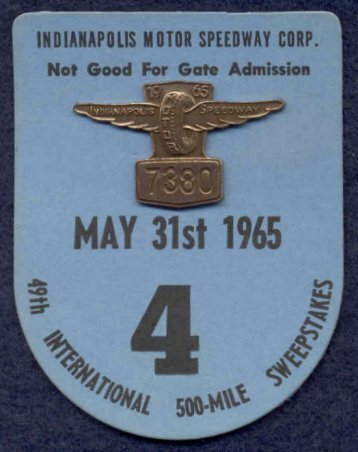 Except for the event logo and the same number designation (77) as a regular back up card for a lap prize donor, it is completely different. In 1987, at least five different back up cards have been accounted for. They differ from previous years in that there are words printed vertically on either side of the back up card. Those known are shown below. *1987 is the only year this was done. (The "PARTICIPANT" is heavily faded.). Located on the front at bottom center, a serial number is now on a back up card for the first time. In 1988 back up cards went to a laminated type of card and remained that way through 2000. The serial number is now on the back of the card in 1988 as well. 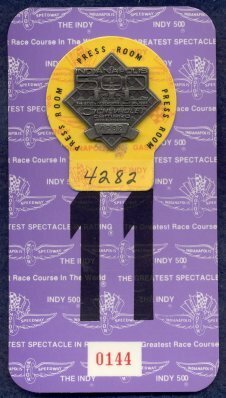 From 1989 through 1996, the Speedway used different colors on back up cards to differentiate between 1's and 99's and all other numbers. There is no date or event logo on back up cards from 1988 through 1996. Dates resume in 1997 and continue through 2001 but are now on the back. 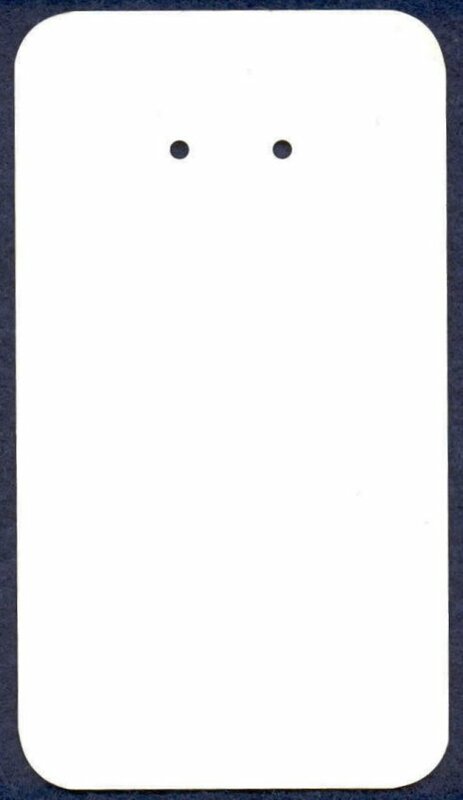 In 1990, the back of the back up card changed with the addition of legal statements which remain on back up cards through 2001 except for the orange 1992 which is blank. Why that year is blank is unknown. Why the serial number is not on the back in 1990 is also unknown but they reappear on the front in 1991 through 2001. 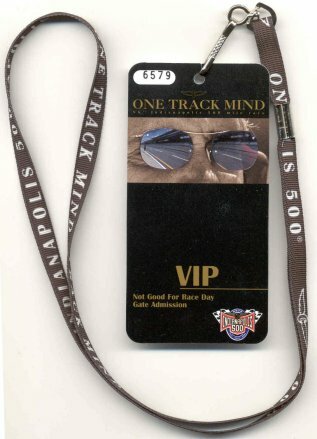 From 1992 through 1999 a smaller back up card was issued which was used for access to the press room/media center. They went with a badge and regular back up card but were not good for race day admission. For 1992-1994 it reads “Press Room”, 1995-1996 “Media Room” and 1997-1999 “Media Center”. For 1992 and 1993 the number* of the badge was written on the card as seen on the 1993 at left but, as seen on the 1992 at center, the corresponding badge was removed and another badge put in its place. To solve that problem, the 1994 card at right now has a serial number so any badge* can go with it. 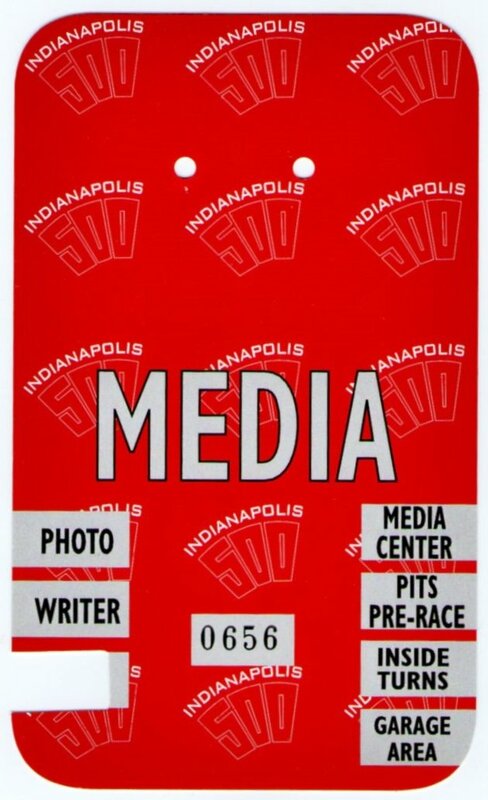 While a press room/media center card made sense for 1992-1996, it seems redundant in 1997 (see 1997 below) to have a “Media” back up card with “Media Center” printed on it and the smaller “Media Center” card at right too. One assumes* the smaller “Media Center” card could’ve been used with the VIP card. 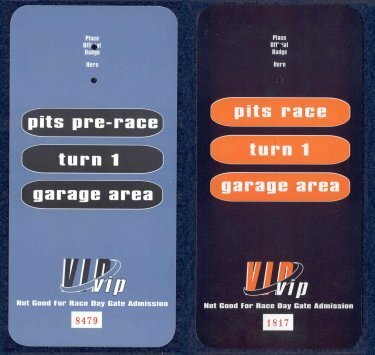 In 1997 the Speedway issued a "hot" (access to certain areas before and during the race) and "cold" (access to certain areas pre-race only) type of back up card with "VIP" or "Media" printed on them. Access was granted to areas not cut out of the card. 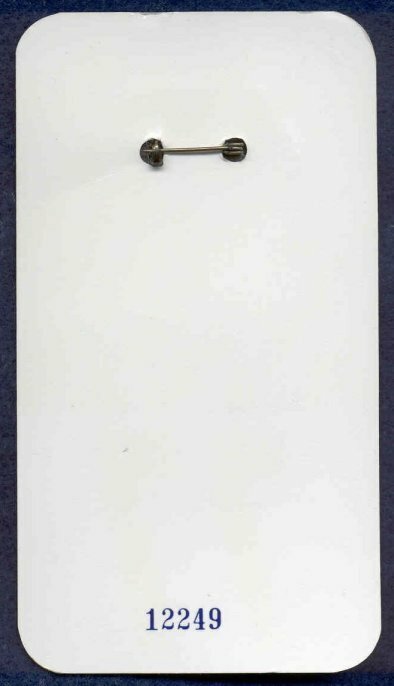 The size of the back up card increases to 7 3/4” x 3 3/4” in 2000 making it the largest back up card. Although still large, the 2001 shrinks to 7 x 1/2” x 3 3/4” and is made of a medium paper. 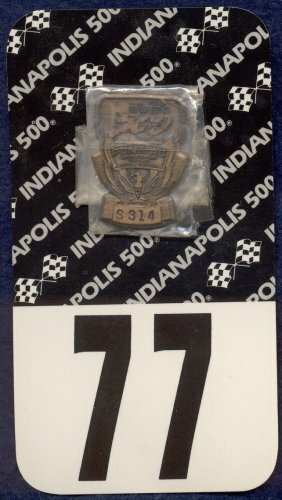 In 2002 the badge was no longer used on race day and back up cards were no longer issued. 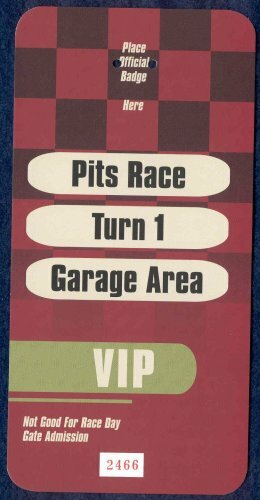 Taking their place was a rectangular plastic hard card (VIP and Race Mode are shown below) which, combined with a lanyard that clipped to the hard card, was good for race day garage and pit access only as these were not good for admission. By far the one off 1971 NATO back up card is the rarest and toughest back up card to find. Back up cards prior to the mid'-1950’s, especially 1947-1951, are tough to find. 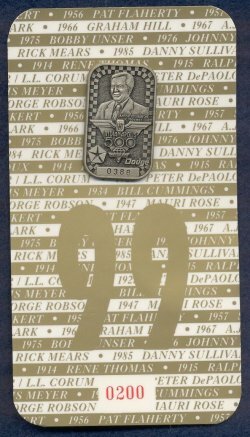 Beginning in the mid-1950’s, more badges began to be produced each year and consequentially the number of back up cards slowly began to increase as well. More cards doesn’t mean they become real easy to find but rather one is more likely to find a card from 1970 verses 1955. The number of back up cards increased in correlation with an increase of overall badges in 1972 making them that much easier to find with even 1’s and 99’s now a bit easier to find. Numbers 1 and 99 are still the back up card to get from 1947 through 1996 and will command a higher price than other numbers in excellent condition. 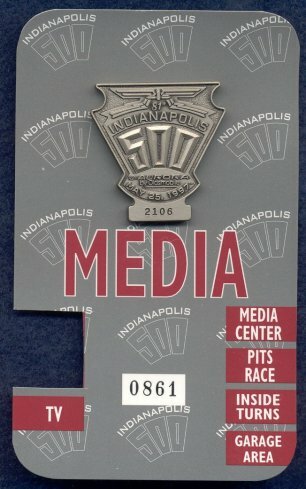 For back up cards from 1997-2001, those allowing access to the pits during the race are more desirable than those allowing pre-race only pit access. Where rain was an issue on race day during the thin cardboard era (1947-1987 and 2001) of back up cards: 1950, 1967, 1970, 1973, 1981, 1986, damage is more likely so those cards with out damage can be tough to find. The best example is 1973 where after three days of rain most back up cards had some sort of rain damage so those with out damage are very tough to find, especially for numbers 1 and 99. The 2001 may also have damage due to its size. The laminated type of card used from 1988-2000 fared better than paper cards in regards to rain, but 1991, 1997 and 2000 (the 2000 may have damage just because of its size) may still have some damage so those with out damage may be harder to find. Fake and reproduction back up cards do exist so please check out the Fake and Reproduction Pit Badges and Back Up Cards page.